LJM-D Series Compact Die Cast Limit Switches with Positive Opening Mechanism. 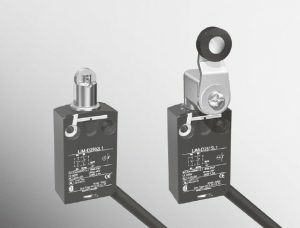 The LJM-D series is a compact die-cast limit switch with positive opening mechanism. The UL, CSA, and CE marking depending on model along with preleaded cabling possible both lengthwise and crosswise from the switch to reduce stress on the cable make this series an ideal choice for machine builders.